Be careful what you eat, says University of Notre Dame stream ecologist Gary Lamberti. If you’re catching and eating fish from a Lake Michigan tributary with a strong salmon run, the stream fish — brook trout, brown trout, panfish — may be contaminated by pollutants carried in by the salmon. It’s a problem inadvertently created by people with good intentions, he notes. Although salmon fed on and contained the alewives — and have become important to sport fishing—there were unintended consequences. That’s because of a lengthy history of industrial pollution of the Great Lakes. Even intentionally introduced species such as the Pacific salmon can result in unintended consequences for the ecosystem and the environment. 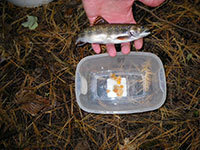 Salmon acquire pollutants through the lake food chain. When they are young, they feed on invertebrates — worms and insect larvae. As they grow larger, salmon consume more and more fish, such as alewives — which have also picked up pollutants through invertebrates they eat, which have picked up pollutants from algae and bacteria. Fish in streams and tributaries with large salmon runs — fish that never go out into the lake, he notes — show contaminant levels very similar to that of Great Lakes salmon. “Let’s keep in mind,” he adds, “there are FDA advisories for pregnant women and children on the risks of eating large Great Lakes fish, because of the danger of chemical contaminants. 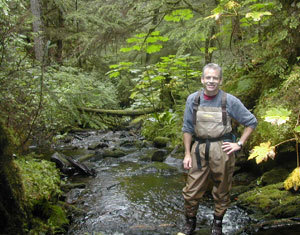 For comparison purposes, Lamberti’s research analyzed the tissue of fish upstream from where salmon spawn and die. Although salmon are an economic benefit to the Great Lakes and perform important ecological functions (such as controlling the population of alewives), we need to consider the impact of salmon on streams where they spawn. “If we want to remove a dam on a river — and that will allow salmon to move upstream — we need to realize that the salmon will carry pollutants with them and disperse them into the food web,” Lamberti says. Originally published by Carol C. Bradley at newsinfo.nd.edu on December 05, 2012.